For the Atari 8-bit computer magazine, see ANALOG Computing. A page from the Bombardier's Information File (BIF) that describes the components and controls of the Norden bombsight. The Norden bombsight was a highly sophisticated optical/mechanical analog computer used by the United States Army Air Force during World War II, the Korean War, and the Vietnam War to aid the pilot of a bomber aircraft in dropping bombs accurately. An analog computer or analogue computer is a type of computer that uses the continuously changeable aspects of physical phenomena such as electrical, mechanical, or hydraulic quantities to model the problem being solved. In contrast, digital computers represent varying quantities symbolically, as their numerical values change. As an analog computer does not use discrete values, but rather continuous values, processes cannot be reliably repeated with exact equivalence, as they can with Turing machines. Unlike machines used for digital signal processing, analog computers do not suffer from the discrete error caused by quantization noise. Instead, results from analog computers are subject to continuous error caused by electronic noise. Analog computers were widely used in scientific and industrial applications where digital computers of the time lacked sufficient performance. Analog computers can have a very wide range of complexity. Slide rules and nomograms are the simplest, while naval gunfire control computers and large hybrid digital/analog computers were among the most complicated. Systems for process control and protective relays used analog computation to perform control and protective functions. The advent of digital computing made simple analog computers obsolete as early as the 1950s and 1960s, although analog computers remained in use in some specific applications, like the flight computer in aircraft, and for teaching control systems in universities. More complex applications, such as synthetic aperture radar, remained the domain of analog computing well into the 1980s, since digital computers were insufficient for the task. Setting up an analog computer required scale factors to be chosen, along with initial conditions—that is, starting values. Another essential was creating the required network of interconnections between computing elements. Sometimes it was necessary to re-think the structure of the problem so that the computer would function satisfactorily. No variables could be allowed to exceed the computer's limits, and differentiation was to be avoided, typically by rearranging the "network" of interconnects, using integrators in a different sense. Running an electronic analog computer, assuming a satisfactory setup, started with the computer held with some variables fixed at their initial values. Moving a switch released the holds and permitted the problem to run. In some instances, the computer could, after a certain running time interval, repeatedly return to the initial-conditions state to reset the problem, and run it again. This is a list of examples of early computation devices which are considered to be precursors of the modern computers. Some of them may even have been dubbed as 'computers' by the press, although they may fail to fit the modern definitions. The south-pointing chariot, invented in ancient China during the first millennium BC, can be considered the earliest analog computer. It was a mechanical-geared wheeled vehicle used to discern the southern cardinal direction. The Antikythera mechanism, dating between 150 and 100 BC, was an early analog computer. The Antikythera mechanism was an orrery and is claimed to be an early mechanical analog computer, according to Derek J. de Solla Price. It was designed to calculate astronomical positions. It was discovered in 1901 in the Antikythera wreck off the Greek island of Antikythera, between Kythera and Crete, and has been dated to circa 100 BC. Devices of a level of complexity comparable to that of the Antikythera mechanism would not reappear until a thousand years later. Many mechanical aids to calculation and measurement were constructed for astronomical and navigation use. The planisphere was a star chart invented by Abū Rayḥān al-Bīrūnī in the early 11th century. The astrolabe was invented in the Hellenistic world in either the 1st or 2nd centuries BC and is often attributed to Hipparchus. A combination of the planisphere and dioptra, the astrolabe was effectively an analog computer capable of working out several different kinds of problems in spherical astronomy. An astrolabe incorporating a mechanical calendar computer and gear-wheels was invented by Abi Bakr of Isfahan, Persia in 1235. Abū Rayhān al-Bīrūnī invented the first mechanical geared lunisolar calendar astrolabe, an early fixed-wired knowledge processing machine with a gear train and gear-wheels, circa 1000 AD. The castle clock, a hydropowered mechanical astronomical clock invented by Al-Jazari in 1206, was the first programmable analog computer. The sector, a calculating instrument used for solving problems in proportion, trigonometry, multiplication and division, and for various functions, such as squares and cube roots, was developed in the late 16th century and found application in gunnery, surveying and navigation. The planimeter was a manual instrument to calculate the area of a closed figure by tracing over it with a mechanical linkage. The slide rule was invented around 1620–1630, shortly after the publication of the concept of the logarithm. It is a hand-operated analog computer for doing multiplication and division. As slide rule development progressed, added scales provided reciprocals, squares and square roots, cubes and cube roots, as well as transcendental functions such as logarithms and exponentials, circular and hyperbolic trigonometry and other functions. Aviation is one of the few fields where slide rules are still in widespread use, particularly for solving time–distance problems in light aircraft. Mathematician and engineer Giovanni Plana devised a Perpetual Calendar machine which, though a system of pulleys and cylinders and over, could predict the perpetual calendar for every year from 0AD to 4000AD, keeping track of leap years and varying day length. The tide-predicting machine invented by Sir William Thomson in 1872 was of great utility to navigation in shallow waters. It used a system of pulleys and wires to automatically calculate predicted tide levels for a set period at a particular location. The differential analyser, a mechanical analog computer designed to solve differential equations by integration, used wheel-and-disc mechanisms to perform the integration. In 1876 James Thomson had already discussed the possible construction of such calculators, but he had been stymied by the limited output torque of the ball-and-disk integrators. In a differential analyzer, the output of one integrator drove the input of the next integrator, or a graphing output. The torque amplifier was the advance that allowed these machines to work. Starting in the 1920s, Vannevar Bush and others developed mechanical differential analyzers. Analog computing machine at the Lewis Flight Propulsion Laboratory circa 1949. The Dumaresq was a mechanical calculating device invented around 1902 by Lieutenant John Dumaresq of the Royal Navy. It was an analog computer which related vital variables of the fire control problem to the movement of one's own ship and that of a target ship. It was often used with other devices, such as a Vickers range clock to generate range and deflection data so the gun sights of the ship could be continuously set. A number of versions of the Dumaresq were produced of increasing complexity as development proceeded. By 1912 Arthur Pollen had developed an electrically driven mechanical analog computer for fire-control systems, based on the differential analyser. It was used by the Imperial Russian Navy in World War I. Starting in 1929, AC network analyzers were constructed to solve calculation problems related to electrical power systems that were too large to solve with numerical methods at the time. These were essentially scale models of the electrical properties of the full-size system. Since network analyzers could handle problems too large for analytic methods or hand computation, they were also used to solve problems in nuclear physics and in the design of structures. More than 50 large network analyzers were built by the end of the 1950s. World War II era gun directors, gun data computers, and bomb sights used mechanical analog computers. In 1942 Helmut Hölzer built a fully electronic analog computer at Peenemünde Army Research Center to calculate V-2 rocket trajectories. Mechanical analog computers were very important in gun fire control in World War II, The Korean War and well past the Vietnam War; they were made in significant numbers. In the period 1930–1945 in the Netherlands Johan van Veen developed an analogue computer to calculate and predict tidal currents when the geometry of the channels are changed. Around 1950 this idea was worked out into the Deltar, an analogue computer supporting the closure of estuaries in the South West of the Netherlands (the Delta Works ). The FERMIAC was an analog computer invented by physicist Enrico Fermi in 1947 to aid in his studies of neutron transport. Project Cyclone was an analog computer developed by Reeves in 1950 for the analysis and design of dynamic systems. Project Typhoon was an analog computer developed by RCA in 1952. It consisted of over 4000 electron tubes and used 100 dials and 6000 plug-in connectors to program. The MONIAC Computer was a hydraulic model of a national economy first unveiled in 1949. Computer Engineering Associates was spun out of Caltech in 1950 to provide commercial services using the "Direct Analogy Electric Analog Computer" ("the largest and most impressive general-purpose analyzer facility for the solution of field problems") developed there by Gilbert D. McCann, Charles H. Wilts, and Bart Locanthi. Educational analog computers illustrated the principles of analog calculation. The Heathkit EC-1, a $199 educational analog computer, was made by the Heath Company, USA c. 1960. It was programmed using patch cords that connected nine operational amplifiers and other components. General Electric also marketed an "educational" analog computer kit of a simple design in the early 1960s consisting of a two transistor tone generators and three potentiometers wired such that the frequency of the oscillator was nulled when the potentiometer dials were positioned by hand to satisfy an equation. The relative resistance of the potentiometer was then equivalent to the formula of the equation being solved. Multiplication or division could be performed depending on which dials were considered inputs and which was the output. Accuracy and resolution was limited and a simple slide rule was more accurate; however, the unit did demonstrate the basic principle. In industrial process control, thousands of analog loop controllers were used to automatically regulate temperature, flow, pressure, or other process conditions. The technology of these controllers ranged from purely mechanical integrators, through vacuum-tube and solid-state devices, to emulation of analog controllers by microprocessors. The similarity between linear mechanical components, such as springs and dashpots (viscous-fluid dampers), and electrical components, such as capacitors, inductors, and resistors is striking in terms of mathematics. They can be modeled using equations of the same form. However, the difference between these systems is what makes analog computing useful. If one considers a simple mass–spring system, constructing the physical system would require making or modifying the springs and masses. This would be followed by attaching them to each other and an appropriate anchor, collecting test equipment with the appropriate input range, and finally, taking measurements. In more complicated cases, such as suspensions for racing cars, experimental construction, modification, and testing is both complicated and expensive. The electrical equivalent can be constructed with a few operational amplifiers (op amps) and some passive linear components; all measurements can be taken directly with an oscilloscope. In the circuit, the (simulated) 'stiffness of the spring', for instance, can be changed by adjusting the parameters of a capacitor. The electrical system is an analogy to the physical system, hence the name, but it is less expensive to construct, generally safer, and typically much easier to modify. As well, an electronic circuit can typically operate at higher frequencies than the system being simulated. This allows the simulation to run faster than real time (which could, in some instances, be hours, weeks, or longer). Experienced users of electronic analog computers said that they offered a comparatively intimate control and understanding of the problem, relative to digital simulations. The drawback of the mechanical-electrical analogy is that electronics are limited by the range over which the variables may vary. This is called dynamic range. They are also limited by noise levels. Floating-point digital calculations have a comparatively huge dynamic range. These electric circuits can also easily perform a wide variety of simulations. For example, voltage can simulate water pressure and electric current can simulate rate of flow in terms of cubic metres per second. An integrator can provide the total accumulated volume of liquid, using an input current proportional to the (possibly varying) flow rate. Analog computers are especially well-suited to representing situations described by differential equations. Occasionally, they were used when a differential equation proved very difficult to solve by traditional means. The accuracy of an analog computer is limited by its computing elements as well as quality of the internal power and electrical interconnections. The precision of the analog computer readout was limited chiefly by the precision of the readout equipment used, generally three or four significant figures. The precision of a digital computer is limited by the word size; arbitrary-precision arithmetic, while relatively slow, provides any practical degree of precision that might be needed. Many small computers dedicated to specific computations are still part of industrial regulation equipment, but from the 1950s to the 1970s, general-purpose analog computers were the only systems fast enough for real time simulation of dynamic systems, especially in the aircraft, military and aerospace field. In the 1960s, the major manufacturer was Electronic Associates of Princeton, New Jersey, with its 231R Analog Computer (vacuum tubes, 20 integrators) and subsequently its 8800 Analog Computer (solid state operational amplifiers, 64 integrators). Its challenger was Applied Dynamics of Ann Arbor, Michigan. Although the basic technology for analog computers is usually operational amplifiers (also called "continuous current amplifiers" because they have no low frequency limitation), in the 1960s an attempt was made in the French ANALAC computer to use an alternative technology: medium frequency carrier and non dissipative reversible circuits. In Europe: CEA (French Atomic Energy Commission), MATRA, Aerospatiale, BAC (British Aircraft Corporation). Analog computing devices are fast, digital computing devices are more versatile and accurate, so the idea is to combine the two processes for the best efficiency. An example of such hybrid elementary device is the hybrid multiplier where one input is an analog signal, the other input is a digital signal and the output is analog. It acts as an analog potentiometer upgradable digitally. This kind of hybrid technique is mainly used for fast dedicated real time computation when computing time is very critical as signal processing for radars and generally for controllers in embedded systems. In the early 1970s analog computer manufacturers tried to tie together their analog computer with a digital computer to get the advantages of the two techniques. In such systems, the digital computer controlled the analog computer, providing initial set-up, initiating multiple analog runs, and automatically feeding and collecting data. The digital computer may also participate to the calculation itself using analog-to-digital and digital-to-analog converters. The largest manufacturer of hybrid computers was Electronics Associates. Their hybrid computer model 8900 was made of a digital computer and one or more analog consoles. These systems were mainly dedicated to large projects such as the Apollo program and Space Shuttle at NASA, or Ariane in Europe, especially during the integration step where at the beginning everything is simulated, and progressively real components replace their simulated part. Only one company was known as offering general commercial computing services on its hybrid computers, CISI of France, in the 1970s. The best reference in this field is the 100,000 simulations runs for each certification of the automatic landing systems of Airbus and Concorde aircraft. After 1980, purely digital computers progressed more and more rapidly and were fast enough to compete with analog computers. One key to the speed of analog computers was their fully parallel computation, but this was also a limitation. The more equations required for a problem, the more analog components were needed, even when the problem wasn't time critical. "Programming" a problem meant interconnecting the analog operators; even with a removable wiring panel this was not very versatile. Today there are no more big hybrid computers, but only hybrid components. While a wide variety of mechanisms have been developed throughout history, some stand out because of their theoretical importance, or because they were manufactured in significant quantities. Most practical mechanical analog computers of any significant complexity used rotating shafts to carry variables from one mechanism to another. Cables and pulleys were used in a Fourier synthesizer, a tide-predicting machine, which summed the individual harmonic components. Another category, not nearly as well known, used rotating shafts only for input and output, with precision racks and pinions. The racks were connected to linkages that performed the computation. At least one US Naval sonar fire control computer of the later 1950s, made by Librascope, was of this type, as was the principal computer in the Mk. 56 Gun Fire Control System. Online, there is a remarkably clear illustrated reference (OP 1140) that describes the fire control computer mechanisms. For adding and subtracting, precision miter-gear differentials were in common use in some computers; the Ford Instrument Mark I Fire Control Computer contained about 160 of them. Arbitrary functions of one variable were provided by cams, with gearing to convert follower movement to shaft rotation. Functions of two variables were provided by three-dimensional cams. In one good design, one of the variables rotated the cam. A hemispherical follower moved its carrier on a pivot axis parallel to that of the cam's rotating axis. Pivoting motion was the output. The second variable moved the follower along the axis of the cam. One practical application was ballistics in gunnery. Coordinate conversion from polar to rectangular was done by a mechanical resolver (called a "component solver" in US Navy fire control computers). Two discs on a common axis positioned a sliding block with pin (stubby shaft) on it. One disc was a face cam, and a follower on the block in the face cam's groove set the radius. The other disc, closer to the pin, contained a straight slot in which the block moved. The input angle rotated the latter disc (the face cam disc, for an unchanging radius, rotated with the other (angle) disc; a differential and a few gears did this correction). Referring to the mechanism's frame, the location of the pin corresponded to the tip of the vector represented by the angle and magnitude inputs. Mounted on that pin was a square block. Rectilinear-coordinate outputs (both sine and cosine, typically) came from two slotted plates, each slot fitting on the block just mentioned. The plates moved in straight lines, the movement of one plate at right angles to that of the other. The slots were at right angles to the direction of movement. Each plate, by itself, was like a Scotch yoke, known to steam engine enthusiasts. During World War II, a similar mechanism converted rectilinear to polar coordinates, but it was not particularly successful and was eliminated in a significant redesign (USN, Mk. 1 to Mk. 1A). Multiplication was done by mechanisms based on the geometry of similar right triangles. Using the trigonometric terms for a right triangle, specifically opposite, adjacent, and hypotenuse, the adjacent side was fixed by construction. One variable changed the magnitude of the opposite side. In many cases, this variable changed sign; the hypotenuse could coincide with the adjacent side (a zero input), or move beyond the adjacent side, representing a sign change. Typically, a pinion-operated rack moving parallel to the (trig.-defined) opposite side would position a slide with a slot coincident with the hypotenuse. A pivot on the rack let the slide's angle change freely. At the other end of the slide (the angle, in trig, terms), a block on a pin fixed to the frame defined the vertex between the hypotenuse and the adjacent side. At any distance along the adjacent side, a line perpendicular to it intersects the hypotenuse at a particular point. The distance between that point and the adjacent side is some fraction that is the product of 1 the distance from the vertex, and 2 the magnitude of the opposite side. The second input variable in this type of multiplier positions a slotted plate perpendicular to the adjacent side. That slot contains a block, and that block's position in its slot is determined by another block right next to it. The latter slides along the hypotenuse, so the two blocks are positioned at a distance from the (trig.) adjacent side by an amount proportional to the product. To provide the product as an output, a third element, another slotted plate, also moves parallel to the (trig.) opposite side of the theoretical triangle. As usual, the slot is perpendicular to the direction of movement. A block in its slot, pivoted to the hypotenuse block positions it. A special type of integrator, used at a point where only moderate accuracy was needed, was based on a steel ball, instead of a disc. It had two inputs, one to rotate the ball, and the other to define the angle of the ball's rotating axis. That axis was always in a plane that contained the axes of two movement-pickoff rollers, quite similar to the mechanism of a rolling-ball computer mouse (in this mechanism, the pickoff rollers were roughly the same diameter as the ball). The pickoff roller axes were at right angles. A pair of rollers "above" and "below" the pickoff plane were mounted in rotating holders that were geared together. That gearing was driven by the angle input, and established the rotating axis of the ball. The other input rotated the "bottom" roller to make the ball rotate. Essentially, the whole mechanism, called a component integrator, was a variable-speed drive with one motion input and two outputs, as well as an angle input. The angle input varied the ratio (and direction) of coupling between the "motion" input and the outputs according to the sine and cosine of the input angle. Although they did not accomplish any computation, electromechanical position servos were essential in mechanical analog computers of the "rotating-shaft" type for providing operating torque to the inputs of subsequent computing mechanisms, as well as driving output data-transmission devices such as large torque-transmitter synchros in naval computers. Other non-computational mechanisms included internal odometer-style counters with interpolating drum dials for indicating internal variables, and mechanical multi-turn limit stops. Considering that accurately controlled rotational speed in analog fire-control computers was a basic element of their accuracy, there was a motor with its average speed controlled by a balance wheel, hairspring, jeweled-bearing differential, a twin-lobe cam, and spring-loaded contacts (ship's AC power frequency was not necessarily accurate, nor dependable enough, when these computers were designed). Electronic analog computers typically have front panels with numerous jacks (single-contact sockets) that permit patch cords (flexible wires with plugs at both ends) to create the interconnections which define the problem setup. In addition, there are precision high-resolution potentiometers (variable resistors) for setting up (and, when needed, varying) scale factors. In addition, there is likely to be a zero-center analog pointer-type meter for modest-accuracy voltage measurement. Stable, accurate voltage sources provide known magnitudes. Typical electronic analog computers contain anywhere from a few to a hundred or more operational amplifiers ("op amps"), named because they perform mathematical operations. Op amps are a particular type of feedback amplifier with very high gain and stable input (low and stable offset). They are always used with precision feedback components that, in operation, all but cancel out the currents arriving from input components. The majority of op amps in a representative setup are summing amplifiers, which add and subtract analog voltages, providing the result at their output jacks. As well, op amps with capacitor feedback are usually included in a setup; they integrate the sum of their inputs with respect to time. Integrating with respect to another variable is the nearly exclusive province of mechanical analog integrators; it is almost never done in electronic analog computers. However, given that a problem solution does not change with time, time can serve as one of the variables. Other computing elements include analog multipliers, nonlinear function generators, and analog comparators. Electrical elements such as inductors and capacitors used in electrical analog computers had to be carefully manufactured to reduce non-ideal effects. For example, in the construction of AC power network analyzers, one motive for using higher frequencies for the calculator (instead of the actual power frequency) was that higher-quality inductors could be more easily made. Many general-purpose analog computers avoided the use of inductors entirely, re-casting the problem in a form that could be solved using only resistive and capacitive elements, since high-quality capacitors are relatively easy to make. The use of electrical properties in analog computers means that calculations are normally performed in real time (or faster), at a speed determined mostly by the frequency response of the operational amplifiers and other computing elements. In the history of electronic analog computers, there were some special high-speed types. Nonlinear functions and calculations can be constructed to a limited precision (three or four digits) by designing function generators—special circuits of various combinations of resistors and diodes to provide the nonlinearity. Typically, as the input voltage increases, progressively more diodes conduct. When compensated for temperature, the forward voltage drop of a transistor's base-emitter junction can provide a usably accurate logarithmic or exponential function. Op amps scale the output voltage so that it is usable with the rest of the computer. Any physical process which models some computation can be interpreted as an analog computer. Some examples, invented for the purpose of illustrating the concept of analog computation, include using a bundle of spaghetti as a model of sorting numbers; a board, a set of nails, and a rubber band as a model of finding the convex hull of a set of points; and strings tied together as a model of finding the shortest path in a network. These are all described in Dewdney (1984). 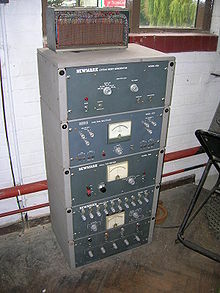 A 1960 Newmark analogue computer, made up of five units. This computer was used to solve differential equations and is currently housed at the Cambridge Museum of Technology. Analog computers often have a complicated framework, but they have, at their core, a set of key components which perform the calculations, which the operator manipulates through the computer's framework. Key hydraulic components might include pipes, valves and containers. Key mechanical components might include rotating shafts for carrying data within the computer, miter gear differentials, disc/ball/roller integrators, cams (2-D and 3-D), mechanical resolvers and multipliers, and torque servos. In some analog computer designs, multiplication is much preferred to division. Division is carried out with a multiplier in the feedback path of an Operational Amplifier. Differentiation with respect to time is not frequently used, and in practice is avoided by redefining the problem when possible. It corresponds in the frequency domain to a high-pass filter, which means that high-frequency noise is amplified; differentiation also risks instability. In general, analog computers are limited by non-ideal effects. An analog signal is composed of four basic components: DC and AC magnitudes, frequency, and phase. The real limits of range on these characteristics limit analog computers. Some of these limits include the operational amplifier offset, finite gain, and frequency response, noise floor, non-linearities, temperature coefficient, and parasitic effects within semiconductor devices. For commercially available electronic components, ranges of these aspects of input and output signals are always figures of merit. In the 1950s to 1970s, digital computers based on first vacuum tubes, transistors, integrated circuits and then micro-processors became more economical and precise. This led digital computers to largely replace analog computers. Even so, some research in analog computation is still being done. A few universities still use analog computers to teach control system theory. The American company Comdyna manufactured small analog computers. At Indiana University Bloomington, Jonathan Mills has developed the Extended Analog Computer based on sampling voltages in a foam sheet. At the Harvard Robotics Laboratory, analog computation is a research topic. Lyric Semiconductor's error correction circuits use analog probabilistic signals. Slide rules are still popular among aircraft personnel. With the development of very-large-scale integration (VLSI) technology, Yannis Tsividis' group at Columbia University has been revisiting analog/hybrid computers design in standard CMOS process. Two VLSI chips have been developed, an 80th-order analog computer (250 nm) by Glenn Cowan in 2005 and a 4th-order hybrid computer (65 nm) developed by Ning Guo in 2015, both targeting at energy-efficient ODE/PDE applications. Glenn's chip contains 16 macros, in which there are 25 analog computing blocks, namely integrators, multipliers, fanouts, few nonlinear blocks. Ning's chip contains one macro block, in which there are 26 computing blocks including integrators, multipliers, fanouts, ADCs, SRAMs and DACs. Arbitrary nonlinear function generation is made possible by the ADC+SRAM+DAC chain, where the SRAM block stores the nonlinear function data. The experiments from the related publications revealed that VLSI analog/hybrid computers demonstrated about 1–2 orders magnitude of advantage in both solution time and energy while achieving accuracy within 5%, which points to the promise of using analog/hybrid computing techniques in the area of energy-efficient approximate computing. In 2016, a team of researchers developed a compiler to solve differential equations using analog circuits. Leonardo Torres y Quevedo's Analogue Calculating Machines based on "fusee sans fin"
Analog (audio) synthesizers can also be viewed as a form of analog computer, and their technology was originally based in part on electronic analog computer technology. The ARP 2600's Ring Modulator was actually a moderate-accuracy analog multiplier. The Simulation Council (or Simulations Council) was an association of analog computer users in USA. It is now known as The Society for Modeling and Simulation International. The Simulation Council newsletters from 1952 to 1963 are available online and show the concerns and technologies at the time, and the common use of analog computers for missilry. Wikimedia Commons has media related to Analog computers. ^ "Gears of war: When mechanical analog computers ruled the waves". ^ Johnston, Sean F. (2006). Holographic Visions: A History of New Science. OUP Oxford. p. 90. ISBN 978-0191513886. ^ The Antikythera Mechanism Research Project Archived 2008-04-28 at the Wayback Machine, The Antikythera Mechanism Research Project. Retrieved 1 July 2007. ^ G. Wiet, V. Elisseeff, P. Wolff, J. Naudu (1975). History of Mankind, Vol 3: The Great medieval Civilisations, p. 649. George Allen & Unwin Ltd, UNESCO. ^ Fuat Sezgin "Catalogue of the Exhibition of the Institute for the History of Arabic-Islamic Science (at the Johann Wolfgang Goethe University", Frankfurt, Germany) Frankfurt Book Fair 2004, p.35 & 38. ^ Silvio A. Bedini, Francis R. Maddison (1966). "Mechanical Universe: The Astrarium of Giovanni de' Dondi", Transactions of the American Philosophical Society 56 (5), pp. 1–69. ^ D. De S. Price (1984). "A History of Calculating Machines", IEEE Micro 4 (1), pp. 22–52. ^ Tuncer Őren (2001). "Advances in Computer and Information Sciences: From Abacus to Holonic Agents", Turk J Elec Engin 9 (1), pp. 63–70 . ^ Donald Routledge Hill (1985). "Al-Biruni's mechanical calendar", Annals of Science 42, pp. 139–163. ^ Neufeld, Michael J. (2013). The Rocket and the Reich: Peenemunde and the Coming of the Ballistic Missile Era. Smithsonian Institution. p. 138. ISBN 9781588344663. ^ Ulmann, Bernd (2013-07-22). Analog Computing. Walter de Gruyter. p. 38. ISBN 9783486755183. ^ Neufeld (2013), p. 106. ^ Tomayko, James E. (1 July 1985). "Helmut Hoelzer". IEEE Annals of the History of Computing. 7 (3): 227–240. doi:10.1109/MAHC.1985.10025. ^ Bissell, C. (2007-02-01). "Historical perspectives – The Moniac A Hydromechanical Analog Computer of the 1950s". IEEE Control Systems Magazine. 27 (1): 69–74. doi:10.1109/MCS.2007.284511. ISSN 1066-033X. ^ "History – Accounts". me100.caltech.edu. ^ Karplus, Walter J. (29 November 2017). "Analog simulation: solution of field problems". McGraw-Hill – via Google Books. ^ Petersen, Julie K. (2003). Fiber optics illustrated dictionary. CRC Press. p. 441. ISBN 978-0-8493-1349-3. ^ "Heathkit EC - 1 Educational Analog Computer". Computer History Museum. Archived from the original on 2010-05-20. Retrieved 9 May 2010. ^ "Basic Fire Control Mechanisms". maritime.org. ^ "Analog Computers". Comdyna. Archived from the original on 2017-12-01. Retrieved 2008-10-06. ^ "Glenn Cowan". Concordia.ca. Retrieved 2016-02-05. ^ Cowan, G.E.R. ; Melville, R.C. ; Tsividis, Y. (2005-02-01). "A VLSI analog computer/math co-processor for a digital computer". Solid-State Circuits Conference, 2005. Digest of Technical Papers. ISSCC. 2005 IEEE International. 1: 82–586. doi:10.1109/ISSCC.2005.1493879. ISBN 978-0-7803-8904-5. ^ "Ning Guo". Columbia University. Retrieved 2016-02-05. ^ Guo, Ning; Huang, Yipeng; Mai, Tao; Patil, S.; Cao, Chi; Seok, Mingoo; Sethumadhavan, S.; Tsividis, Y. (2015-09-01). "Continuous-time hybrid computation with programmable nonlinearities". European Solid-State Circuits Conference (ESSCIRC), ESSCIRC 2015 – 41st: 279–282. doi:10.1109/ESSCIRC.2015.7313881. ISBN 978-1-4673-7470-5. ^ "Simulation Council newsletter". Archived from the original on 2013-05-28. A.K. Dewdney. "On the Spaghetti Computer and Other Analog Gadgets for Problem Solving", Scientific American, 250(6):19–26, June 1984. Reprinted in The Armchair Universe, by A.K. Dewdney, published by W.H. Freeman & Company (1988), ISBN 0-7167-1939-8. Universiteit van Amsterdam Computer Museum. (2007). Analog Computers. Librascope Development Company – Type LC-1 WWII Navy PV-1 "Balance Computor"
This page was last edited on 11 April 2019, at 16:26 (UTC).